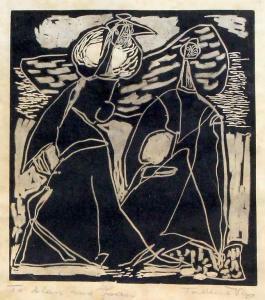 Find artworks, auction results, sale prices and pictures of Tadeusz Was at auctions worldwide. 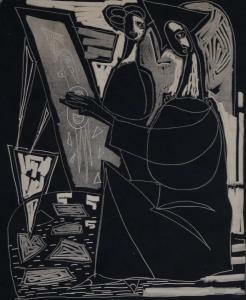 Tadeusz Was (Polish, 1912-2005) - 'Two Figures' Pencil signed sootcut print, approx 21x17cm, mounted but unframed. NB: Story has it that the process of sootcut was discovered by Tadeusz Was while stationed in the desert in World War II, he apparently held orange peel over a burning oil lamp and the resulting soot produced formed perfect impressions when in contact with paper. For further information please see www.tadeuszwas.co.uk/history/html. 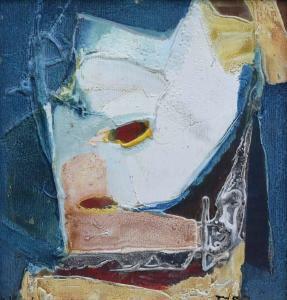 Tadeusz Was (1912-2005), "Composition", signed, titled and dated 1974 on artist's label verso, mixed media, 30 x 28cm. ; 11.75 x 11in. * Tadeusz trained at the Polish Institute of Fine Art, Krakow for five years before being conscripted into the Polish Army. Tadeusz taught art in Crewe for many years and set up a coalition of Artists known as Group Five who exhibited throughout the Northwest. A solo exhibition - \`\`\`\`\`\`\`\`Lost in Crewe\`\`\`\`\`\`\`\` was held at the Museum and Art Gallery, Warrington in 1991 and an exhibition at the Portico Gallery, Manchester was very well received in June 30th, 2005. Artists' Resale Right (droit de suite) may apply to this lot. 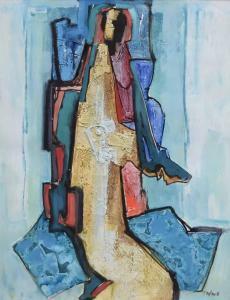 Tadeusz Was (1912-2005), Figure, signed, mixed media, 54 x 42cm. ; 21.25 x 16.5in. * Tadeusz trained at the Polish Institute of Fine Art, Krakow for five years before being conscripted into the Polish Army. Tadeusz taught art in Crewe for many years and set up a coalition of Artists known as Group Five who exhibited throughout the Northwest. A solo exhibition - \`\`\`\`Lost in Crewe\`\`\`\` was held at the Museum and Art Gallery, Warrington in 1991 and an exhibition at the Portico Gallery, Manchester was very well received in June 30th, 2005. Artists' Resale Right (droit de suite) may apply to this lot.